Is the OnePlus One dropping in price? Update: The OnePlus 2 has NOT been announced. Instead, OnePlus is offering limited time discounts on its now year-old OnePlus One handset. The 16GB model can be had for $249, £179 at timed intervals through the week (June 1-7). If you fancy a bit more space the 64GB model is a snip at $299, £219. This could be the company's last ditch attempt at clearing stock before releasing the OnePlus 2, which is now slated for a Q3 (July - September) arrival. OnePlus has been teasing a big announcement, and while many assumed it might be the reveal of the OnePlus Two, new rumours suggest that we'll also be seeing a price cut for the incredibly popular OnePlus One. 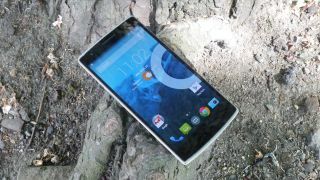 Citing sources close to OnePlus, PhoneArena has reported that on June 1 the OnePlus One will see its price cut, with the 64GB Sandstone Black model dropping to $298 (around £195, AU$389). The 16GB Silk White version will also be cut to $248 (around £162, AU$324), which amounts to a $50 price cut for both models. The price cut will apparently take effect worldwide – though in India the prices are claimed to be remaining the same.